Hate surprises or love them? Our brains handle surprises and attraction and aversion (valence in techno speak) in different ways. The amygdala processes emotional responses and a new study indicates that two distinctly differing sets of neurons within it respond to either reward or aversion. And not only that, but that the expectation of reward or aversion also triggers these networks of neurons. The speculation is that the intensity of reward and aversion effect is intensified by surprise and that neural circuitry is required to process both surprise and the degree of attraction or aversion that an individual feels towards specific events. The brain neurons of liberals and conservatives fire differently when confronted with tough choices, suggesting that some political differences may, at least in part, be hard-wired. David Amodio, Assistant Professor of Psychology, New York University, is a self-described social neuroscientist. Using methodologies such as functional magnetic resonance imaging in combination with behavioral measures he examines the interactions of the brain with its social environment. Intrigued by previous studies showing strong links between political persuasion and certain personality traits as well as the fact that such affinities between political views and “cognitive style” can be heritable, Dr. Amodio brought together 43 test subjects. Using electroencephalographs, which measure neuronal impulses, the researchers examined activity in a part of the brain — the anterior cingulate cortex — that is strongly linked with the self-regulatory process of conflict monitoring. The match-up was unmistakable: respondents who had described themselves as liberals showed “significantly greater conflict-related neural activity” when the hypothetical situation called for an unscheduled break in routine. Which leaves the question of “nature or nurture” still unanswered – at least for the moment. But it does provide interesting thought for coaching. As we consider our political views and actions we do well to remember that our first and most powerful responses tend to be emotion-based. And so we learn to factor in emotional bias. This study suggests that we factor in as well the idea that political leaning and cognitive style may have some degree of hard-wiring involved. Since perceived threat, one of the fundamentals behind conflict-monitoring, drives certain predictable behavioral responses, we know in advance that to have any sort of constructive dialog across such divides we need to alleviate the threat. Issues aside, the threats for conservatives and liberals are processed differently according to this study. Recognition of that fact can let us make allowances for differences in thinking styles rather than attributing differences to intent. And that at least adds another tool for building an agreed-upon arena for dialog if nothing else. Recent work by Bradley L. Schlaggar and Steven Peterson of the Washington University School of Medicine in St. Louis suggests that two independent control centers manage our voluntary, goal-oriented behavior. One is flexible and rapidly adapts to changing feedback. The other can focus in on something and tune out distractions until the task is finished. Scientists exploring the upper reaches of the brain’s command hierarchy were astonished to find not one but two brain networks in charge, represented by the differently-colored spheres on the brain image above. 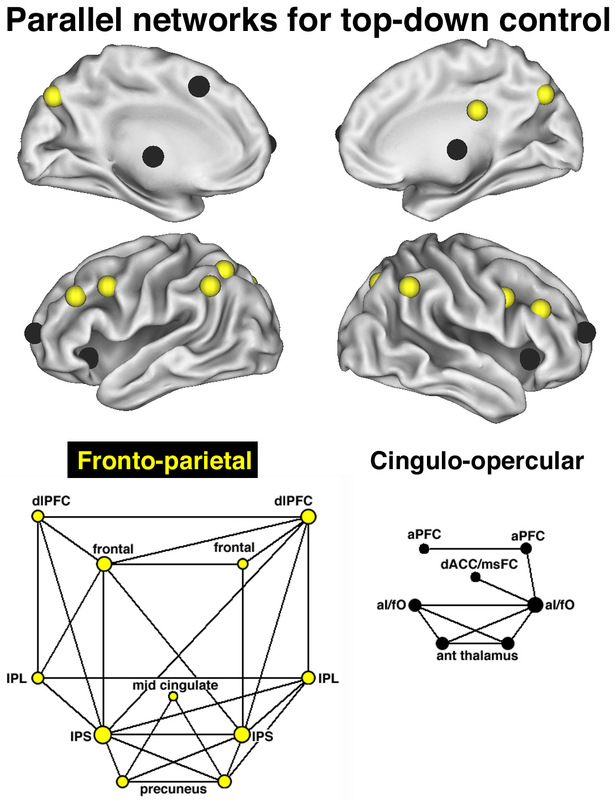 Starting with a group of several brain regions implicated in top-down control (the spheres on the brain), they used a new brain-scanning technique to identify which of those regions work with each other. When they graphed their results (bottom half), using shapes to represent different brain regions and connecting brain regions that work with each other with lines, they found the regions grouped together into two networks. The regions in each network talked to each other often but never talked to brain regions in the other network. This is seen as an example of a class of systems known as complex adaptive systems, common both in nature and even other bodily systems such as temperature control. Subsequent research now indicates that these two systems begin as one system in children and only differentiate into two independent systems as we mature. This suggests, among other things, why children are unable to resist impulse behaviors that hurt their long-term goals. The longer term network is “clamped” inside the network that rapidly adapts and is only able to fully express itself once it effectively separates out.